There is so much to consider before buying a condominium. Condos can be more involved than buying a single family home since you are buying both the unit itself as well as a part of the entire condominium complex. You’ll need to investigate fully in order to make a well-informed decision and avoid potential pitfalls. 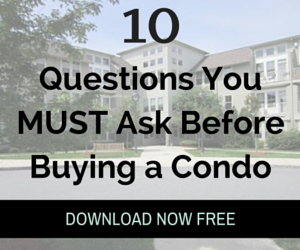 Fill out the form below to download the 10 important questions you MUST ask before you make an offer on a condo!